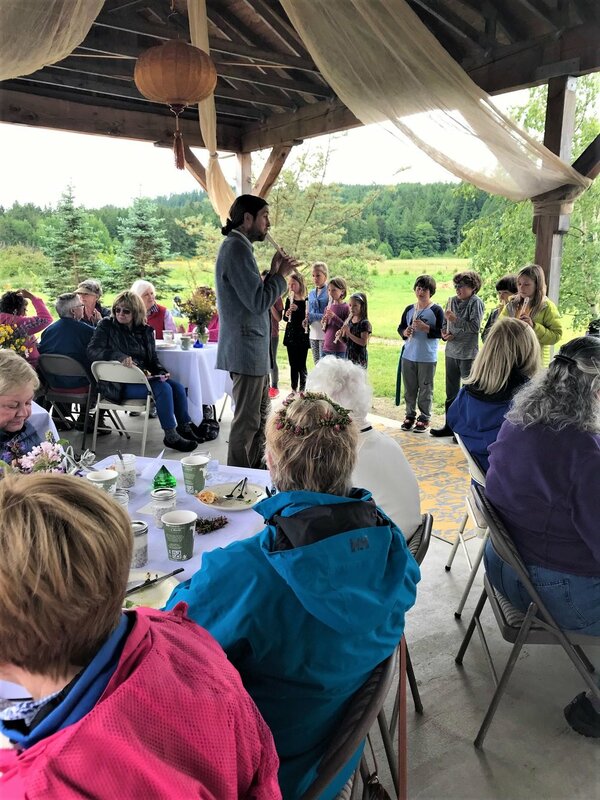 On June 7th, the women’s group spent the afternoon touring the Sunfield Farm & Waldorf School in Port Hadlock. Pictures are worth a thousand words, so we hope that those of you who were unable to attend enjoy seeing our experience through the photos as much as reading about it. Everything about the day was so well planned, and nothing was overlooked. We were settled under a pavilion with lovely table settings accented with handpicked flowers, the menu was handwritten in beautiful calligraphy, and the meal gave us a taste of a true farm to table experience with beautiful salads, a chilled yogurt and chickpea soup, and a cardamom apple turnover along with a unique refreshing herbal drink. The highlight of the event was the participation of the students and their teachers in helping us understand the educational approach of the school and its relationship to the biodynamic organic farm. We heard from Farmer Ezera Sullivan, Educator Ms. Helen Curry, Administrator Abra Debris, and President of the Board of Trustees, Sym Sebastian, and Carol Wright. The older children treated us to music on their Recorders, while the younger ones crafted flower wreaths for each of us. Watching the children as they went about their farm responsibilities was a real treat. They fed the baby goats, picked flowers that will be used to make tea, revealed a secret garden, and showed us an intricate May Pole (yes, they still exist) that they braid every year. It was so moving to see the joy of youngsters playing in a way that was so educational and demonstrated such an intimate connection to the land. It was a reminder of simpler times, and it is here in our very own backyard. Your leaders (Peggy Kulm, Deanne Pedersen, and Jamie Bima) anticipate at least two more women’s group events this year. We are open to suggestions for opportunities that provide us with a chance to share experiences that connect us with one another and build on the camaraderie that is so vibrant with the Yacht Club. Drop us a line or give us call and tell us about your ideas.